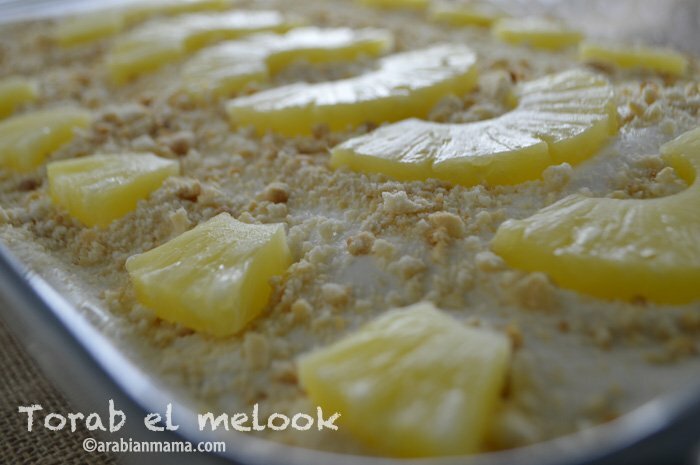 Creamy, fluffy and sweet, this pineapple flavored dessert is perfect for hot summer nights. I’ve tried to track down the origin of this dish but I ended up empty handed!!. I’ve got this recipe from a Palestinian friend but she does not claim that it is a true Palestinian dessert. 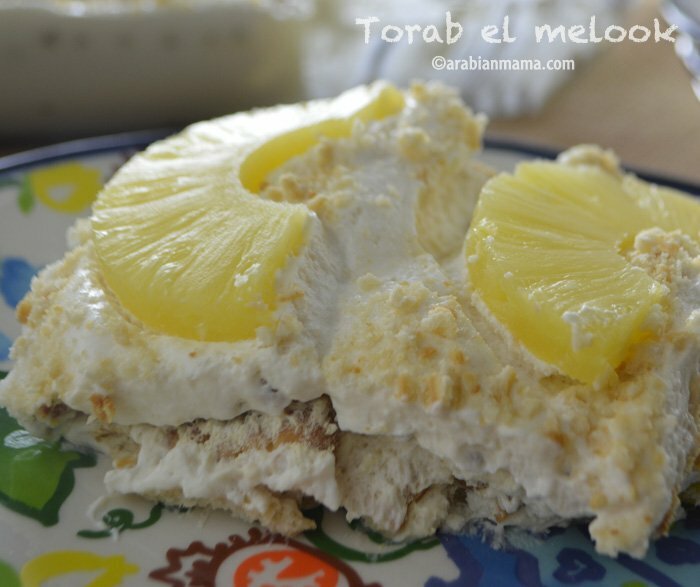 Toarab means dust and el melook are the kings so the translation for this dish is kings’ dust..
You may wonder what does this mean, well the idea of the dish is that it is a very creamy, fluffy dessert that is topped an stuffed with pineapples – a very rare and expensive fruit in the Middle East – and topped with crumbled biscuits that looks like sand or ” torab”. So the name can be translated to Kings’ sand as well. Again what does this mean? Well, this dish indicates how the royals were- and still are- living in luxury and wealth leaving their people live in poverty. The point is those kings and queens are walking on things that their people cannot even afford to eat. If you let me choose I would not only call this dish Kings’ dust but also presidents’ dust. Looking at what those in power are doing and how they are living in the Middle East I would dare to call it also the vise presidents’ dust , the minsters’ dust and the list goes on and on. 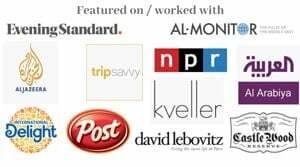 People in the Middle East are not allowed to have their Jon Stewart or Letterman , so instead they are creative in using their own kitchen to mock their leaders, but they have to be careful not to get caught :). I’ll stop here so not to be boring and not to vent on you and ruin your day. Despite the bitter meaning behind this dessert, it actually tastes very very delicious and it is very suitable for the summer days. 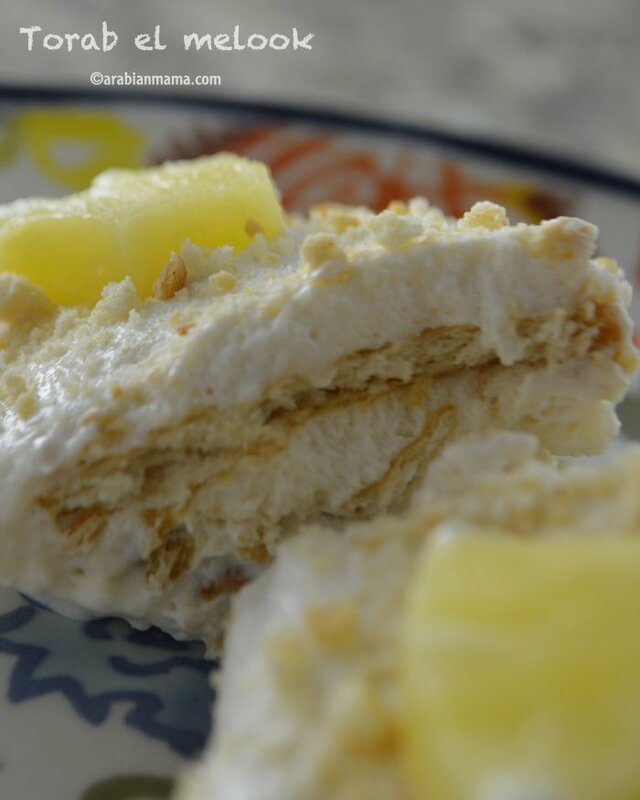 This dessert should be made with crema or you can use mascarpone cheese which gives the dish its richness, but you can omit this ingredients if you are aiming for a less calorie version. 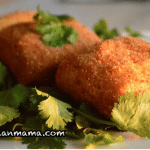 Here is a short video showing you how to prepare torab el melook. I hope you will like it and I hope you will have a chance this summer to try this out. Have a great weekend. 1 can of Nestle table cream or you can use a 3.5oz tub of mascarpone cheese. 1 can of pineapple slices with juice. 1/2 to 3/4 can of condensed milk. 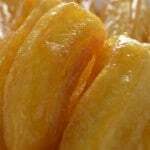 Cut the pineapple slices into chunks, leaving 3 whole rings to be cut into halves. Prepare the dream whip according to package directions. Add the Nestle cream or the mascarpone cheese and mix. Then add half the can of the condensed milk, mix very well then taste for sweetness.If you still need more add a Tbs at a time, mix and taste until you reach your desired sweetness. Sprinkle some crushed biscuits in the bottom of your dish. Dip biscuits in the pineapple juice.Arrange in your dish. Top with a layer of the cream we've just made and smooth the surface. Add a layer of the diced pineapples.Then another layer of dipped biscuits. Then another layer of the cream and so on until you reach the top edge of your dish. At the end sprinkle the rest of the crushed biscuits. Arrange the pineapple slices on top in a decorative way. let it set in the fridge for a couple of hours before serving. It’s funny, all of my aunts make this dessert (without the biscuits) and they learnt it while living in Saudi. I’ve had this many times at their homes and I know it tastes delicious. Instead of biscuits, they add jelly. It’s so interesting where all these names originate!